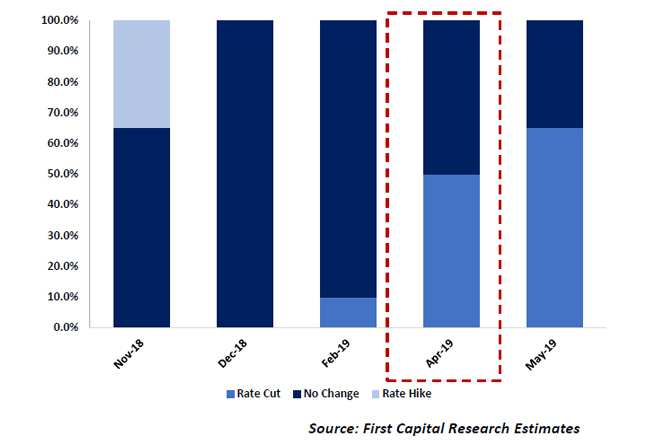 Apr 02, 2019 (LBO) – First Capital Research allocates a 50 percent probability for a policy rate cut in Apr 2019 as they are of the view that policy intervention is appropriate to address the overly sluggish economic growth. Sluggish sentiment in Sri Lanka’s economy has been a major concern with the latest GDP growth for 4Q2018 recording an alarmingly low 1.8 percent. Growth protracted in 2018 with annual GDP growth trimming to 3.2 percent compared to 3.4 percent in 2017. “Keeping in line with the possible introduction of a single policy rate, we believe a rate cut, if at all, will be applicable only to SLFR,” the firm said in a pre-policy analysis. The Monetary Policy Review No. 2 of 2019 which was previously scheduled to be issued on 10 April 2019 as announced in the Road Map 2019, has been rescheduled to 08 April 2019 at 4.30 p.m. The Central Bank reduced the SRR by 100bps to 5 percent in February to address the large and persistent liquidity deficit which prevailed in the domestic money market. The rupee continued to strengthen to close at 176.17 on 28 Mar 2019 supported by foreign remittance conversions and foreign inflows. “We expect the REER to have reached 97-98 range with the rupee appreciation together with the strengthening of the dollar index in Feb and Mar 2019,” First Capital Research said. Meanwhile, the Fed reserve officials have decided to keep rates unchanged at the meeting held in March and signaled to pause rate hikes in 2019 while certain analysts expect a possible reversal instance to a single rate cut in late 2019. “Global fund flow which is already shifting towards emerging markets is likely to further strengthen and continue with the US yields easing off,” First Capital Research said.